The Intersections & Beyond: DLS-CSB Technical Theater Program reinterprets Floy Quintos' "Fluid"
DLS-CSB Technical Theater Program reinterprets Floy Quintos' "Fluid"
De La Salle-College of Saint Benilde’s Technical Theater Program Batch 111 proudly presents a reinterpretation of the Palanca Award-winning play, Fluid, written and directed by Floy Quintos. It will be held at 5/F SDA Theater, School of Design and Arts Campus. 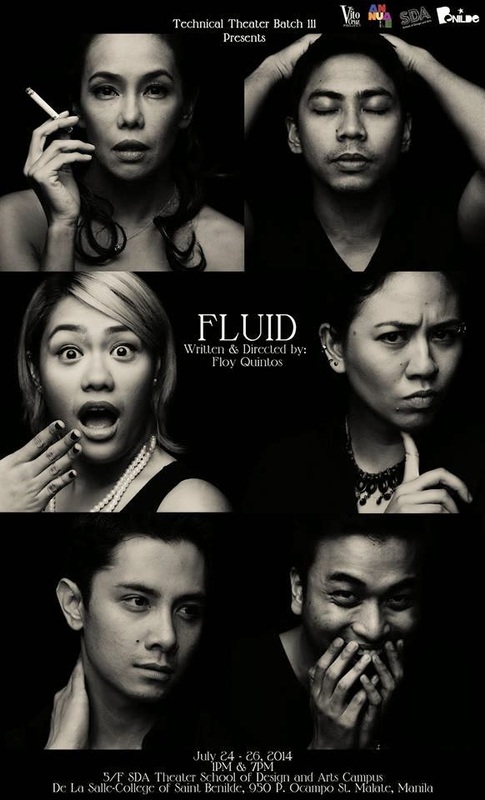 Fluid is written as a series of scenes in different locations featuring three pairs of characters who seemingly have nothing to do with each other. Amir is a struggling and frustrated young painter whose life is about to be changed by Mira a wealthy art collector who dreams of discovering new talent. Jom and Alben are passionate theater actors torn between their passion for their craft and the lure of fame. Renata is a seemingly batty orchestra coordinator out to defend the dignity of her orchestra when it is hired to play at a society wedding by the overbearing events coordinator, Simone. All these unique and clashing characters come together unexpectedly at an art exhibit where their impulses lead to a joyful mayhem. 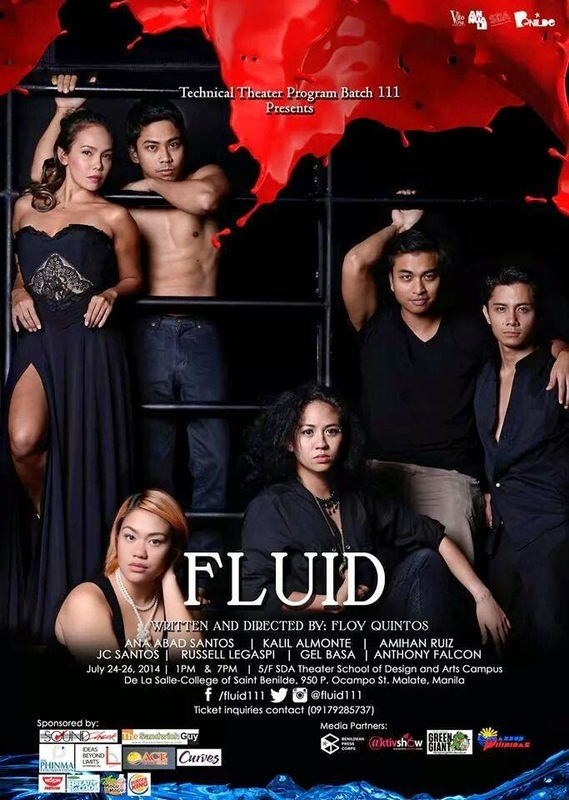 The cast of Fluid is made up of professional actors. Red Turnip Theater’s Ana Abad Santos who originally created the role of Mira in 2004 reprises her role. Kalil Almonte last seen in Sintang Dalisay and Games People Play plays Amir. JC Santos, fresh from his tint in Hong Kong’s Disneyland and Singapore’s Universal Studio, plays the ambitious Jom while Russell Legaspi last seen in this year’s Labfest plays the earnest Alben. Amihan Tanedo Ruiz and Gel Basa both last seen in “Breakaway Antigone” play Renata and Simone respectively. Musical Theater actor Tony Falcon also appears in the show.